Call or email for tech help and to order. Shown with optional items such as the conical filter, air divider and Romeo engine style balancer. These items are sold separately. STANDARD Magnuson M112 Positive Displacement Supercharger with self contained synthetic lubrication. Capable to approx. 600 RWHP! A silver powder coat finish is standard, while a show polish finish is optional. Aluminum lower intake manifold with remote coolant thermostat housing. All hardware, brackets, hoses, and installation instructions. The standard items above provide maximum safe allowable stock engine power and allow for significant future power improvements. Installation is straight-forward and can easily be completed by any DIY enthusiast with basic hand tools in a weekend or less. Our detailed Installation Instructions are shown on the left side of the main page. With this kit the customer or installation shop is to provide their own air filter, fuel injectors, fuel pump, MAFS & adapter, computer tune to suite what ever power level they plan for. A Romeo style harmonic balancer is to be used. A Cobra throttle cable, and threaded type ACT are also to be purchased by the customer. The air divider shown in the picture above is an optional item. Tork Tech does offer all these items individually if you already have some, but not all of these items. For customers with built engines and upgraded fuel systems TTI does offer larger lower crank pulleys and smaller upper pulleys to significantly raise boost levels to achieve nearly 600 RWHP with the M112 kit. UPGRADEABLE to the latest generation Eaton 1900 TVS blower for power levels far in excess of 700 HP! Video of a '99 GT dyno run with the IC MP112 kit installed. Side view showing the depth of our lower intake which allows for a huge volume of air and also a VERY large intercooler core. Notice the size of our custom oval single blade throttle body too! The blower is run using an independent drive and has its own belt rather then using the stock accessory belt. Boost can easily be changed by removing 3 bolts on the lower pulley and installing a larger pulley. We designed the kit to cover all the bases. With an upgraded fuel system, a lower pulley change, a new tune, headers/dual 2.5" exhaust and some forged internals/ported heads you do not need to purchase anything else to make over 500 HP. Other manufacturers are known for offering mandatory "accessories" but we decided to package our kit so it is capable of huge power with minimal changes. Compare the Tork Tech Inc. product to the other competitors using a positive displacement supercharger. You will see there is no comparison! 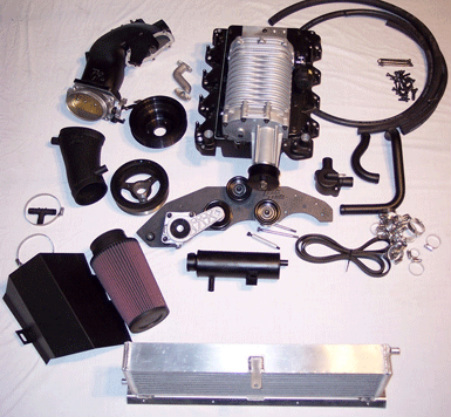 Other manufacturers sell their non-IC kits in the price range AND their kits do not include a performance throttle body, intake tube, or the 8-rib pulley setup Tork Tech does! Place your order, install the kit, and your reaction will be the same as one customer recently commented, "It's like driving a '03-04 Cobra. It just keeps you nailed in the seat." 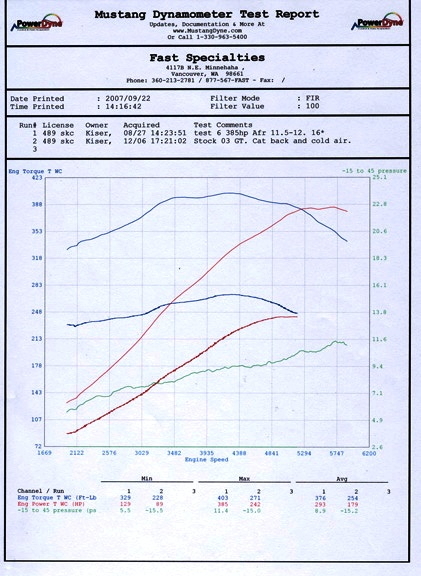 Rear wheel HP improved from 242 to 385 and Torque from 271 to 403 on a Mustang type dyno! Notice the 100 ft-lb improvement in torque as low as 2000 RPM that you don't see from a centrifugal kit. Click to enlarge Cross Brace Assy. Will have silver finish. Click to enlarge Coolant Hose Assy.